"As best as I could understand it, the Buddha’s main thesis was that in a world where everything is constantly changing, we suffer because we cling to things that won’t last"
Meditation and mindfulness have become buzzwords over the years, fascination growing for some and regarded as fluffy concepts completely subjugated from the fast paced, ruthless world of business by skeptics. 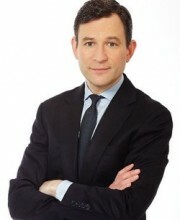 Dan Harris, author of 10% Happier, has set out to squash those misconceptions and has worked to demystify the practices for the modern day professional. Harris started out on this exploration into meditation as a relentless, driven newscaster and journalist, chasing stories, fame and prestige at whatever cost. Facing the upward hustle, Harris recounts his struggle with mental illness, substance abuse and burnout, sharing with his readers the ugly side of the fight for success. Tasked with the dreaded assignment of crafting newsworthy stories centered on faith, “self-help”, and its prescribers, Harris, the deep skeptic, stumbled across the growing phenomenon of mindfulness, and its various world-renowned gurus. While working to give them their platform, Harris found himself digging deeper into the complicated and often inauthentic approach to finding Zen. 10% Happier is his journey through the weeds. Reading like a first-hand account, the reader is able to experience the ebbs and flows of realization, alongside the skeptic himself. "Mindfulness is the ability to recognize what is happening in your mind right now—anger, jealousy, sadness, the pain of a stubbed toe, whatever—without getting carried away by it." As a professional, the concept of slowing down and observing the moment can seem counterintuitive. Surprisingly, the biggest takeaway Harris shares with his readers is that practicing meditation should be rendered a tool in the great toolbox of success, rather than a hindrance. As a rookie, Harris shed light on his personal discovery of the seemingly earth-shattering concept of “letting go”. “There’s a difference between the raw sensations we experience and the mental spinning we do in reaction to said stimuli,” he explains. Quickly learning that “letting go” and “passivity” are very different, Harris, through his personal trial and error, fundamentally squashes the concern that meditation practice would result in a loss of productivity, progress or results. By letting go of mishaps, frustrations and setbacks, readers learn to replace them with valuable observations that drive growth and ultimately success. “Is this useful?” quickly became a personal mantra for Harris, and is a large takeaway for his readers. Harris shares the basics of mediation practice with the acronym R.A.I.N. (Recognize, Allow, Investigate, Non-Identification). While completing his first silent retreat, Harris learns to recognize feelings that arose throughout the meditation process rather than attempt to ignore. Allow gives those feelings and thoughts the space to be, and investigate encourages participants to dig deeper into the affect of those feelings/thoughts on your physical person. Lastly, non-identification is the logical last step, basically dismissing or refusing to allow those feelings or thoughts to define your character. This acronym is both a practical and intuitive practice for rookies and readers alike. A true convert, Harris makes it clear that practicing mindfulness is not just for people in loosely clad clothing with incense burning in every room. Mindfulness is a valuable practice that serves his personal life and his professional life well, allowing for growth, patience and ultimately success. "I do it because it makes me 10% happier…counterprogramming against the overpromising of the self-helpers while also offering an attractive return on investment." Practically speaking, this audience is looking for tangible and realistic takeaways, and after serving up the big [and controversial] push for meditation, Harris follows up with a modest promise. Give it a whirl, it could make you 10% happier. Having started out as a skeptic himself, Harris could anticipate the familiar questions that would come with sharing his journey. Admirably, Harris doesn’t offer a sweeping statement or vague promise of enlightenment; rather he makes it relatable and surprisingly appealing. Who doesn’t want to be 10% happier? Paired with the The Big Idea of “letting go”, readers are promised an ROI on happiness in all arenas of their life. Practicing mindfulness for 5 minutes a day, Harris shares, made him calmer, more relatable, more focused and more present in all areas of his life. "It’s non-attachment to the results. I think for an ambitious person who cares about their career… its natural to be trying really hard. Then the Buddhist thing comes in around the results—because it doesn’t always happen the way you think it should." “Striving is fine, as long as it’s tempered by the realization that, in an entropic universe, the final outcome is out of your control,” Harris writes. Easier said that done, right? Right. For those who have yet to add meditation to their toolbox. Readers can identify with Harris as he struggles through this concept. Ultimately landing on the need to deepen one’s practice, exercise patience in development and maintain a heightened focus on process rather than the end result. In not so many words, Harris’s writing reads like it’s directed at his anticipated skeptics. As if he could anticipate the eye rolls, the immediate dismissal and the counter arguments, he lends a very biased but very relatable approach to his exploration and acceptance of mindfulness and meditation as a daily practice. Throughout his journey he ultimately crafts a sort of Mindfulness for Dummies for professionals and common folk alike—dangling a couple [very appealing] carrots that even the harshest of critics would be foolish to snuff at. Now the question remains, will you give it a shot?